Jenson Button admits he is finding the uncertainty over his future in Formula 1 "strange". 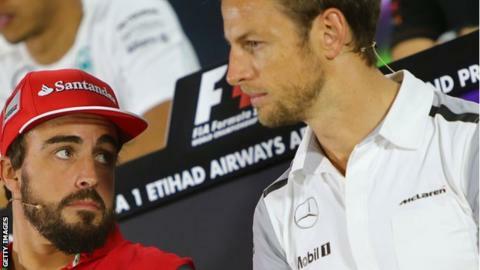 McLaren are yet to decide whether the Briton or his 2014 team-mate, Denmark's Kevin Magnussen, should partner Spaniard Fernando Alonso next season. "It's a strange situation but sometimes in life you find yourself in these situations. You just have to deal with it," Button said. McLaren's Eric Boullier said the decision could be made "within days". Racing director Boullier said the team were taking the time to make sure they made the right decision. Both men were talking at the Autosport Awards on Sunday evening, where world champion Lewis Hamilton won the trophies for international racing driver of the year and British competition driver. Collecting his awards, Hamilton said he hoped 2009 champion Button, his former McLaren team-mate, would get the nod. Hamilton singled out Button at his table and said: "Jenson, I see you over there, man. I hope you're here next year, dude." Button played down the situation, saying: "If it was my first year in F1 it would be a lot more difficult but I've had an amazing career in F1 and to win a world championship and what I've achieved, it's been an amazing experience. "A couple of months ago it was very tricky but now you just go with it and the last few races have been really enjoyable. "I worked with some amazing people at McLaren. It's been a real pleasure to work with those guys." McLaren have not yet confirmed Alonso is joining the team and are only planning to do so once they have decided on the identity of his team-mate. A board meeting last Thursday broke up without a decision on the driver line-up. McLaren have declined to give a reason for the delay. Alonso has signed a contract worth a reputed £25.5m a year. While Button would likely accept a cut from his previous salary of £12m, it is thought he would not come down to the level of Magnussen's pay, which was about £500,000 in 2014.